A week after Hurricane Maria tore through the Caribbean, Puerto Ricans are still struggling to get basic relief supplies and make contact with loved ones. But as the US territory’s leaders focus on the looming humanitarian crisis, scientists are starting to think about another longer-term impact of the storm, its effect on the island’s treasured ecosystems. An early stock-tacking of the El Yunque National Forest—the only tropical rainforest managed by the US Forest Service, and a hub for scientific research—is painting a grim picture, but the forest is expected to bounce back. “Devastated,” said Bill McDowell, an ecologist at the University of New Hampshire who has spent decades leading research efforts in El Yunque, when asked how the rainforest has fared. 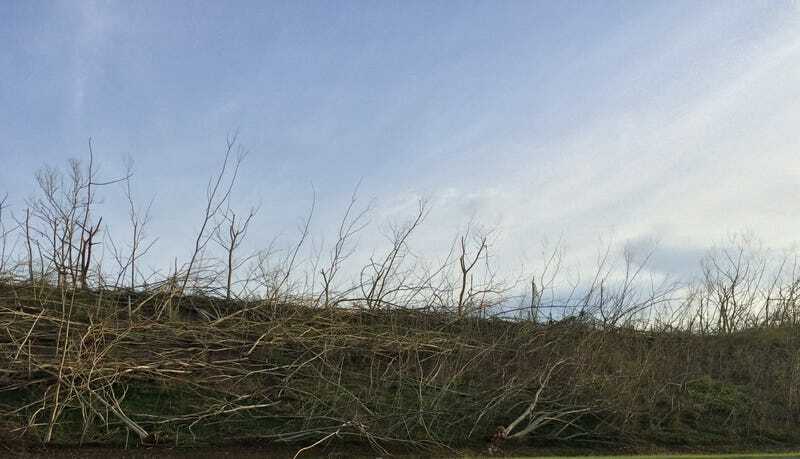 Photos shared with Earther by researchers who have been out in the field confirm McDowell’s appraisal, showing felled trees, canopies stripped of their leaves, and battered field stations badly in need of repair. But there’s a silver lining: El Yunque is a hurricane-adapted ecosystem, and as it rebounds, scientists will be watching and learning new things about rainforest recovery. Spanning nearly 30,000 acres of rugged terrain in the northeast corner of of Puerto Rico, the El Yunque National Forest is home to a dazzling diversity of flora, fauna and ecosystems, from sweltering lowland rainforests that hum with chirps of Coqui frogs, to chilly, cloud-covered dwarf forests that pepper the towering Luquillo mountains. Thanks to its accessibility to US researchers, El Yunque is also home to a lot of science. Indeed, since the 1940s, El Yunque has supported hundreds of scientific studies and yielded dozens of PhD dissertations (disclosure: this author’s included) in fields ranging from ecology to geophysics, all made possible by state-of-the-art field stations and access roads managed by the US Forest Service. It’s home to a National Science Foundation-funded LTER and a Critical Zone Observatory, as well as the world’s first tropical forest warming experiment. It’s no exaggeration to say that much of our understanding of how tropical forests work comes from El Yunque. All of that science screeched to a halt when Maria slammed into Puerto Rico as a powerful Category 4 hurricane last week. The good news, according to McDowell, is that most of the researchers in the broader LTER and CZO communities—the two El Yunque-based research efforts he’s directly involved with—have now been accounted for. Now that they know folks are safe, the scientists are developing a response plan to assess damage to the forest and to their field sites. So far, all signs suggest El Yunque took a serious beating from Hurricane Maria, which, as McDowell points out, struck just 10 days after Hurricane Irma grazed the island, causing “significant damage” to the rainforest. In email correspondences shared with Earther, researchers discussed major structural damage to buildings at the El Verde Field Station, a site managed by the University of Puerto Rico that offers scientific laboratories and lodging. Parts of this facility might have to be condemned and rebuilt. A hurricane season like this is unprecedented for El Yunque’s scientists. But we can get some clues as to what ecosystem recovery might look like by examining past powerful storms, including Hurricane Hugo, which clipped northeast Puerto Rico as a strong Category 3 in 1989. Still, Covich is optimistic about the forest’s recovery. “We think things are pretty resilient and will come back within weeks and months, like they did after Hugo. Six to 12 months from now, the forest will be in fine shape,” although different organisms might emerge as the dominant species. Covich says his colleagues in Puerto Rico are just now beginning to assess damage near El Yunque’s scientific field stations. He hopes more scientists can visit the island and check out their sites within the coming week, although with only a few flights in and out every day, everyone expects delays. “My guess is that by next week we’ll have some more observations, some real measurements,” he said. “I think the Forest Service is struggling too—their funds have been cut for research,” Covich added. Earther has reached out to the Forest Service for comment, and we will update this post if and when we hear back. Limited though their resources may be, El Yunque’s scientific community is committed to using this hurricane season as a laboratory for ecosystem recovery. But Covich also emphasized the El Yunque forest’s vital importance to the people of Puerto Rico, especially in times of need. “What I’ve been telling folks is you can’t have clean water on steep slopes if you don’t have a rainforest,” Covich said, noting that following hurricanes, landslides and erosion send plumes of sediment and debris into headwaters in the Luquillo mountains. A robust forest helps keep these critical rivers clean. Hopefully, the El Yunque rainforest will show the same resiliency that the people of Puerto Rico have in wake of this disastrous hurricane season. If Irma and Maria have reminded us of one thing, it’s that human and natural ecosystems are better off when they are working together.